Make the most of your pen tests. Beyond being required periodically by certain regulatory requirements, penetration testing can be a valuable means of identifying weaknesses in your network and security program. 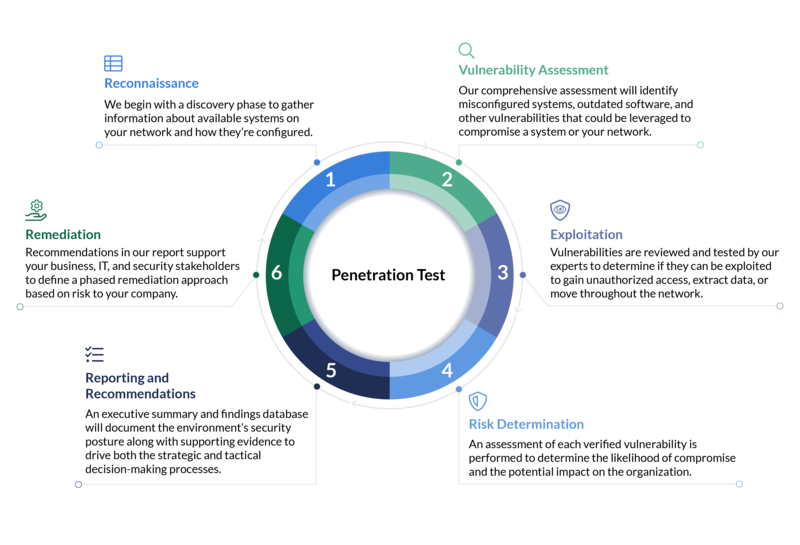 Pen tests can be used to validate automated vulnerability systems, as well as test both your network and physical security. Whether your organization wants a pen test for the sake of compliance, best practices, or just want to better understand the state of your environment, CISOSHARE can help. Our team conducts a comprehensive review of vulnerabilities that could be exploited without credentials, such as port scanning, service probing, exploit research, and IDS/IPS system testing. We test weaknesses that can be accessed from within your network security, such as system fingerprinting, firewall and access control, administrator privilege escalation, and configurations. We evaluate the security of your web application for input validation attacks, cross-site scripting attacks, SQL injections, cookie theft, database vulnerabilities, and other common online attack methods. Our team mixes black box and white box testing with a site survey and map of the wireless infrastructure. We'll complete signal leakage testing, device discovery, physical device inspections, and other wireless-related protocol tests. Our team will attempt to manipulate your employees into allowing unauthorized access to confidential information, including tactics like authority disguises, employee impersonation, USB drops, phishing, and other common methods. Test employee security through social engineering tests including physical security, phishing emails, and other security tests. Identify and understand the vulnerabilities within both your internally-facing and externally-facing networks. Properly configure your endpoints, wireless access points, and other network devices to keep data safe with an expert team. Conduct annual or other regularly scheduled pen tests to comply with HIPAA, PCI, and other regulatory requirements.